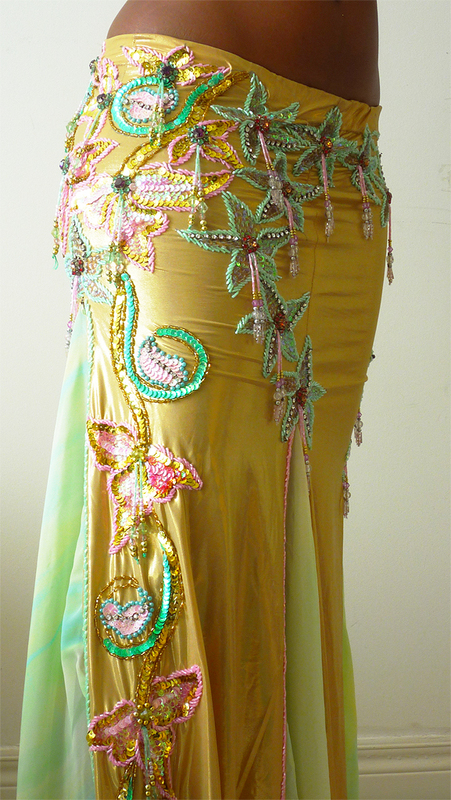 Shown below, I have a few bellydance costume beauties that need a new home. Contact info@sabadance.com if interested. – Simple elegant design. Comfortable and easy to wear. – Great for small frames. – Cup 2 or B, can fit up to small C. Or stuff more for A. – Stretchy embroidered layer skirt on top with see-through meshy skirt layer underneath. Both laid on shorts with lots of leg. – Thighs: can fit aprx 22 – 27 in. – Cup B, can fit up to small C. Or stuff more for A. 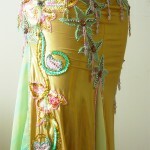 – Gold skirt with chiffon inserts. Can take of chiffon if you want slit instead. – Upper Hips: can adjust aprx 31 – 35 in.